Professor Shabtai Rosenne, 93, the oldest member of the Turkel commission investigating the deadly raid on the Gaza-bound flotilla died Tuesday from a heart attack in Jerusalem. Rosenne was an International Law professor, Israel Prize laureate and winner of the 2004 Hague Prize for International Law. 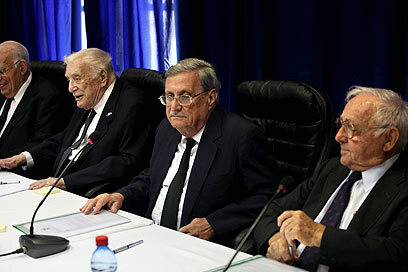 Judge Jacob Turkel said of him: "The departure of Prof. Rosenne is a great loss to his family, the Jewish people, the International Law community and members of the committee." His funeral will be held in Jerusalem on Wednesday. Rosenne was born in 1917 in London. In 1940-1946 he served in the British Royal Air Force. Later on he worked in the Jewish Agency's political department. After the establishment of the State of Israel, he served as the Foreign Ministry's legal advisor, until 1967. After completing his stint as legal advisor he served in a number of positions, including deputy ambassador to the United Nations (1967-1971) and Israel's representative in the UN and international organizations in Geneva (1971-1974). The Turkel committee began working earlier this month and has heard the testimonies of Prime Minister Benjamin Netanyahu, Defense Minister Ehud Barak, IDF Chief of Staff Gabi Ashkenazi, Military Advocate General Avichai Mandelblit and other senior officials such as Mossad director Meir Dagan. Sources at the Prime Minister's Office said that Rosenne will likely not be replaced as the committee is at the last stages of its work. See all talkbacks "Turkel committee member Shabtai Rosenne dies at 93"